Ask Dan! about DSS - How do data analytics support data-based decision-making? How do data analytics support data-based decision-making? Analysis of data or data analytics is an integral component of a successful organizational digital transformation strategy. Data analytics refers to a set of innovative tools and techniques used to generate insights from large, diverse data sets. Use of data analytics can offer individuals, organizations, governments, and our global society “data-based” perspectives on existing challenges and possible solutions. Data analytics can provide facts to improve data-based decision-making. Data analytics help find meaning in an increasingly complex environment. In her Teradata blog, Yasmeen Ahmad (2016) identified five advantages of data analytics, including: 1) increased proactivity and the ability to anticipate needs, 2) new security and fraud analytical capabilities, 3) delivering the right products and services at the right time, 4) improved personalization and service, and 5) optimizing and improving the customer experience. Ahmad is Director at Think Big Analytics, a Teradata Company, and an optimistic champion for greater use of data. 4) Managing data and providing information is widely perceived as the responsibility of the IT function. Traditionally, business managers did not engage in data/information management, typically their focus has been talent management, financial and marketing management activities. The typical manager focuses too narrowly on activities and often neglects understanding the information that is received. 5) There is an urgent need to develop more informed skeptics. "Employees need to recognize that not all numbers are created equal—some are more reliable than others." Notably, Shah et al’s study highlights the widespread perception that data analytics is the responsibility of the organization’s IT function. More recently, it has been broadly acknowledged that data analytics should “put information in the hands of business analysts and business users and offer significant potential to create business value and competitive advantage” (Jones, 2016). Benefits of data analytics are always constrained or limited by the manager or managers who use the results to make decisions. In order to achieve meaningful integration between data analytics tools and technologies, data analytics must be tackled in parallel with a data-informed program for change. This integrated, more holistic view of the process of data analytics is illustrated in Figure 1. 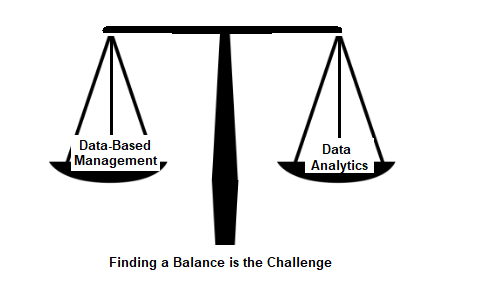 It is difficult to negotiate the balance between an organization’s approach to data analytics and a data-based management strategy. To achieve this dual focus, it is essential that managers meaningfully engage with the process of analyzing data to leverage new data insights and integrate them into the organization’s decision-making processes. Shah et al. (2012) suggest that managers need to be better trained to use new analytics tools, paying particular attention to building analytics into managerial decision making processes. If a balance is not achieved, managers run the risk of investing in new expensive data analytics technologies that are not used by and for managers. Davenport noted 10 years ago that "we’ll have to have more and more analytical people in organizations to make effective use" of analytical capabilities. Implement the "right" amount of data analytics to support a data-based culture and that should lead to better data-based decision making and data-based management. The overriding goal is to use data analytics and decision support to assist in managing directed technology change. Power, D., "Tom Davenport Interview: Competing on Analytics", DSSResources.COM, 05/27/2007 at URL dssresources.com/interviews/davenport/davenport05272007.html.